The Lupo 130 is geared for skiers who want the versatility of a high performance freeride boot that also features tech inserts for touring. A burly ski/hike lever is integrated into its 3 Piece Cabrio design, providing instant access to excellent climbing capability. An added feature is the removable tongue - when removed, the boot has a full 67 degree range of motion. With the tongue installed for the way back down, the skier enjoys the legendary freeride performance that Krypton architecture provides. Unlike many traditional overlap boots in its category, the Lupo's Cabrio 3 Piece design does not require any modification of the lower shell to enable a hike mode, so the skier enjoys great in-bounds performance no matter what the conditions. The new IF AIR liner is thermo-formable for an optional instant break-in after just a few minutes of heating. * This unique construction combines a 3 piece construction assembly. * The Cabrio design is a 3 piece construction - shell/cuff/tongue – that comfortably secures the foot and lower leg while optimizing smooth and progressive flexibility. 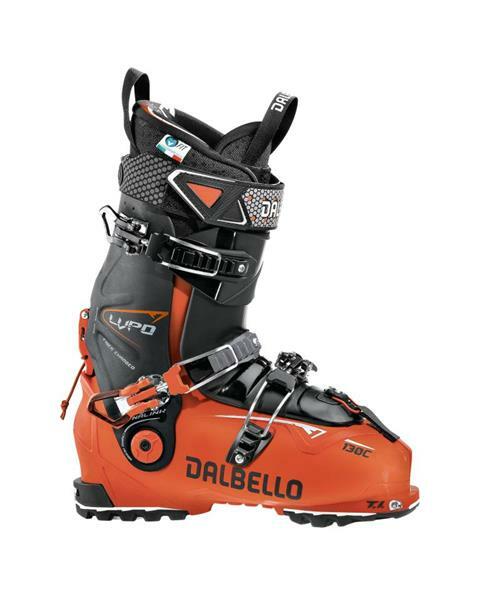 Dalbello’s Cabrio models provide the ultimate in responsive performance to ski your best. * GripWalk contains of a new co-polymer sole with rocker profile. The convex shape and ribbed tread of the rubber add a lot of walking comfort and provide a much better grip. GripWalk soles are the perfect tuning parts designed for selected premium ski boots and bindings. * Taken away easily with only one hand, the removed tongue offers endless forward lean movement while hiking and great skiing performance for downhilling due to it’s flex. * Forward and Backward lean for the boots. * 67° (40° Forward Lean, 27° Backward Lean) As it’s function of a touring boot, the forward lean while hiking is the most important to walk with. * High leverage cuff assembly with hinge points mounted approximately 10 cm lower than standard construction boot designs. * The LOW HINGING CUFF permits the boot cuff to more easily follow the natural anatomic movement of the skier’s legs because it has a longer range of forward and rearward hinging motion. For more efficient walking and gliding. Increased power and control with less energy. * For enhanced shock absorption on big air landings or on hard snow surfaces. * Landing Gear footboard is a full lenght vibration absorbing urethane innerboot platform that is positioned inside the bootshell, under the foot. Closed cell construction will not compress or lose its shock absorbing properties. * Exclusive Dalbello construction technology that maps the anatomical contours of the foot. * Contour 4 creates subtle “comfort zones” at 4 critical fit points: ankle, heel, 5th metatarsal, & navicular. Relief contours molded into the inside lower shell at these 4 points provide a close and accurate fit and minimize the need for shell modifications. * Unique Dalbello Design. Low friction, wide pro?le shin pad closure securely wraps the upper part of the boot cuf with a wide profile, high leverage cuff closure buckle assembly. Smooth flexing design is highly shock absorbing for maximum boot-top comfort with NO “SHIN-BANG” or, NO “SHIN-BITE”. * High traction composite polyurethane toes & heels. Lightweight and durable textured design for improved traction on all surfaces + anti slip functionality. * The highly resilient polyamide flex ribbed tongue is available in three different kind of flex-stiffness (stiff, medium and soft). All of them stay in permanent contact with the leg and improve the responsiveness and control of the boots behavior. * The Dynalink heel retention is an independently functioning heel / instep closure assembly which minimizes foot sliding, heel lift and boot shell distortion during the flex effectively. * As the burly cuff lock mechanism frees the upper cuff from the lower shell a long range of motion for functional hiking and climbing is guaranteed. Due to the unique Cabrio design it doesn't contain any compromises on the skiing performance. * To align lateral inclination of cuff to skier’s lower leg. * All collection has strong and lightweight aluminum buckles, ergonomically designed for easy use. * Forefoot closure buckle (above instep) are inverted to close on top of the bootshell, not on the side. The top closure positioning prevents buckle breakage and bending during rail slides, grinds, falls, and transitions. * Permits skiers to precisely “fine tunes” buckle closure tension for a more exact fit. * Beeing breathable and warm at the same time are the outstanding benefits of the IF AIR liner. Its medium density EVA foam wrapps the foot instantly and can be fitted 80% to the feet's specific needs. Thanks to its flexible zones in the back part and the quick adjustable laces, the IF AIR is used especially in the Lupo line to support the skier during the hike up and the joyful run down.